Rail : towards drivers being certified using simulation ? 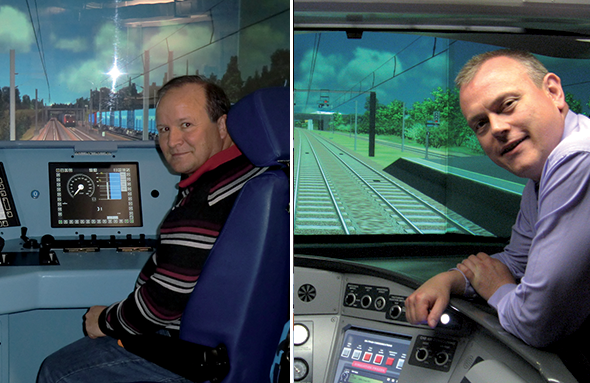 Can a train driver take most of their practical examination on a simulator? In the United States, this has been possible for over fifteen years. In Europe, while examinations on rolling stock remain the benchmark, there are increasing signs of change, particularly in Switzerland and Germany. In the United States, authorities and operators have long considered that practical examinations on simulators offer all the required guarantees of rigour and reliability. The situations to which the driver is exposed can be selected and controlled; assessment of the driver’s reactions is objective; the electronic examination report offers a safeguard for both the candidate and their employer, and so on. Europe has been much more reluctant to follow. For the most part, practical examinations are still carried out on the ground, in spite of the well-known limits of this situation. “Everybody knows that an examination in real conditions takes far longer and above all, does not enable the driver’s responses to dangerous or exceptional situations such as breakdowns, signal failures, adverse weather conditions and so on to be tested,” says Michael Schwerdtfeger, assistant director for Transport at CORYS. In Switzerland, the LOGIN training organisation received the green light from the Federal Office of Transports enabling shunting personnel at the rear of trains to take their practical examination on simulators, in 2008; now it has received authorisation for simulator-based practical examinations for the Level 2 ECTS signalling system. Are the simulators reliable, efficient and faithful to reality ? In Germany, operators use simulators during the mandatory annual tests for their drivers. Although these initiatives remain the exception, several European operators such as Dutch Railways are now seriously looking at going down this route. If these virtual examinations do increase in number, it is certain that the authorities will take a much closer look at the simulators themselves: are they reliable, efficient and faithful to reality from a hardware and software point of view? In the United States, the Federal authority has established a classification system defining the minimum criteria to be met by simulators in order for them to be used for examinations. It would make sense for Europe to follow suit. “Increasingly, we are relying on simulators for learning and examinations, because it’s becoming almost impossible to recreate dangerous situations on the ground. On a network used by more than one operator, it’s very dangerous to create an incident, cut a radio connection or to fault a signal. Unless they do training at night, a learner driver will only ever encounter routine situations. Two years ago, we obtained the permission of the authorities to have the official examination of shunting personnel carried out on simulators. They carry out tasks such as reversing trains or removing rolling stock in the event of an incident. More recently, we have obtained permission for the official drivers’ examination for ECTS signalling. “For many key tasks associated with normal train driving, assessment takes place in a practical situation or by remote surveillance using recording devices on board the train. However, we use simulation to assess know-how to be implemented in emergencies or abnormal situations: an obstruction on the tracks, fire on board, signal failure, an anomaly on the train, and so on. The simulator is the most effective way of realistically assessing how a driver reacts when confronted with such incidents. These tests take place every two years and are recorded in the driver’s file.